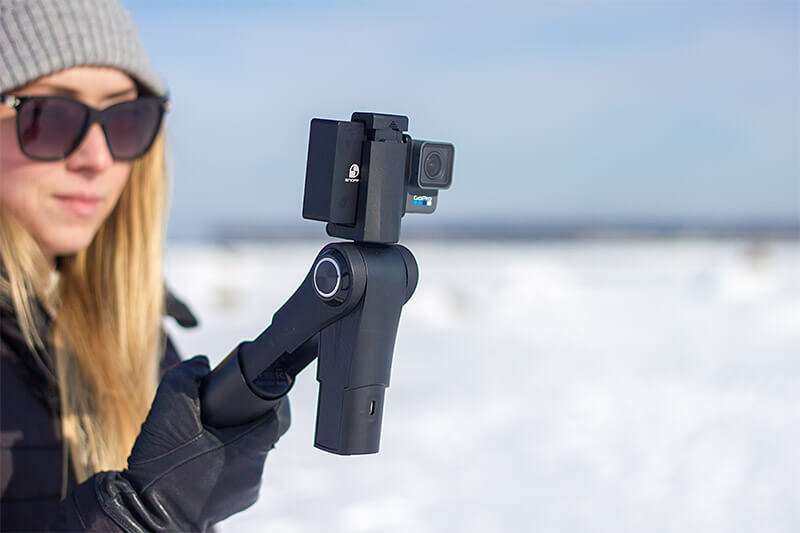 The Snoppa M1 is a very different gimbal and It`s not an action camera gimbal by default – it`s a smartphone gimbal that has an adapter for GoPro cameras so in this review I will focus on testing it with a GoPro camera but will also see how it performs with a smartphone. The gimbal comes in a nice packaging that you open by tearing off a splint from the middle, revealing the quick-starter guide image. It`s a fun little twist they have added and it makes you eager to jump in a see what`s inside. The gimbal itself is packed nicely in a hard foam mold with the charging cable and the lanyard. There is no carry case or a pouch so that`s a small let-down, as some of the competing gimbals do come with a protective pouch. 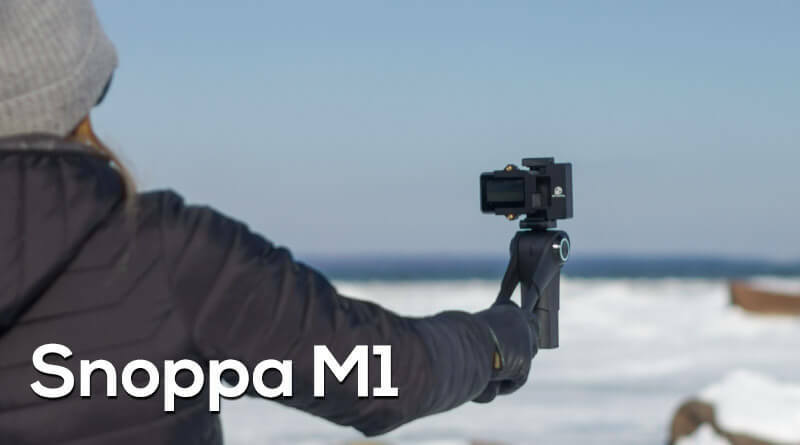 Snoppa M1 is very different from a lot of the other gimbals on the market – I has a different camera/phone attachment and it has a completely different approach to the balancing of the camera. 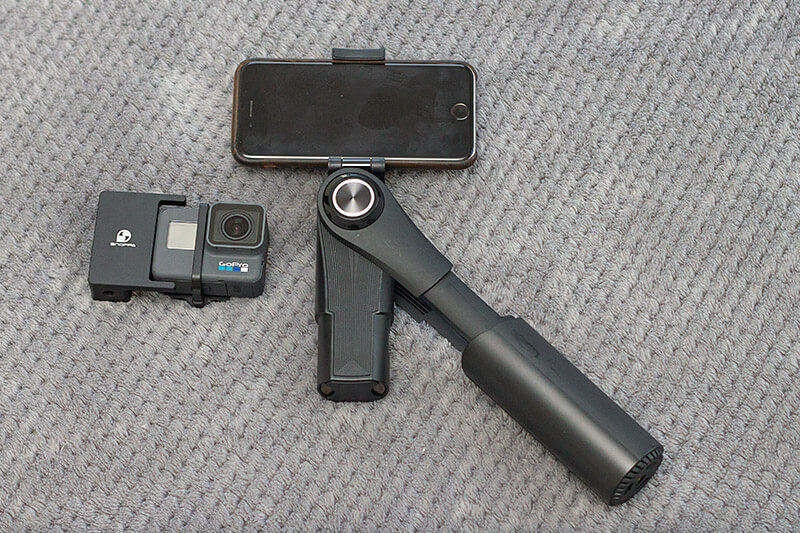 Snoppa M1 can be used with a smartphone or an action camera. It`s ready o used straight out of the box with a smartphone and the thing I love about the Snoppa M1 is that IT HAS NO SCREWS (for mobile phones at least). You can attach your phone with a simple pull-out clip that has enough travel to fit even the larger phones. The clip has a spring system to bite down on the phone and the soft rubber paddings will keep the phone from slipping out. Using the gimbal with a smartphone is super easy and fast! 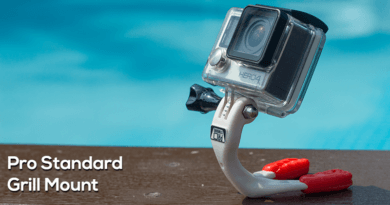 If you want to attach an action camera, like the GoPro, you do need to use an adapter. 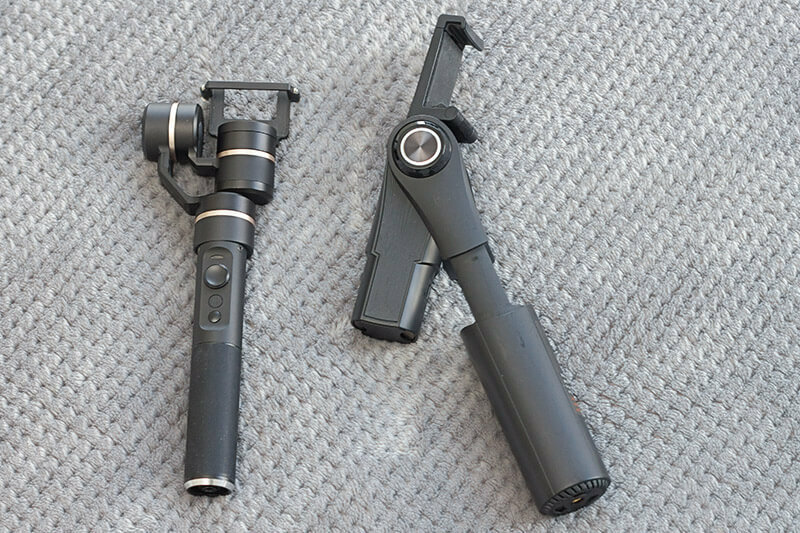 The GoPro adapter is a small black metal counterweight rig that you need to attach to your camera. It sits on the right side of the camera but it doesn`t block the button on the side as it has a cutout to reach the button. 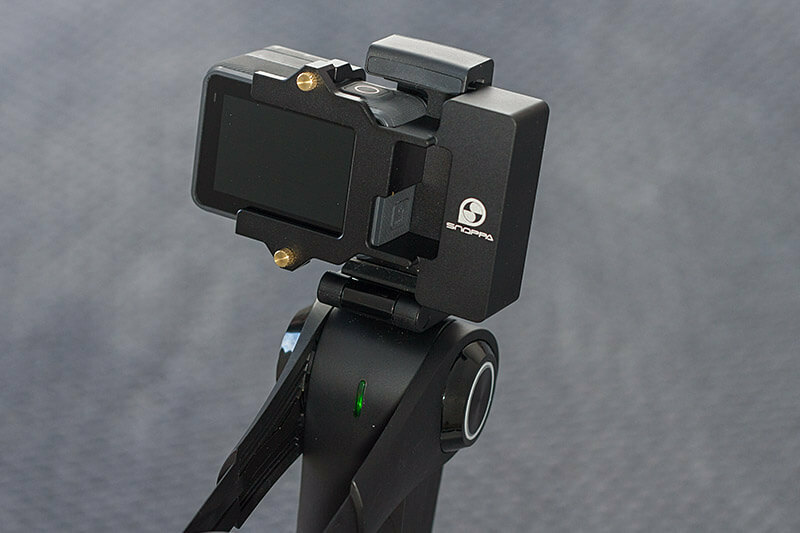 The camera is attached with the familiar clamp and screws system that most gimbals use. Once you have the adapter attached you can easily fit the camera to the phone clip. Snoppa M1 – how it works? The Snoppa M1 is pretty large and heavy compared to other GoPro gimbals I have tested like the Feiyu Tech G5, MOZA Mini G or the RedFox S1P. It weighs almost 500g without the adapter and 600g with the adapter so if you compare it to Feiyu Tech G5 that weighs 385g the difference is massive. This seems to be mainly because of how the M1 balances itself – when you pull the handle out you reveal how large the balancing part of the gimbal is. It`s almost the full length of the grip part. The pull-out, push-in mechanics of the Snoppa M1 is something that I have not seen before and I have a love/hate relationship with it. 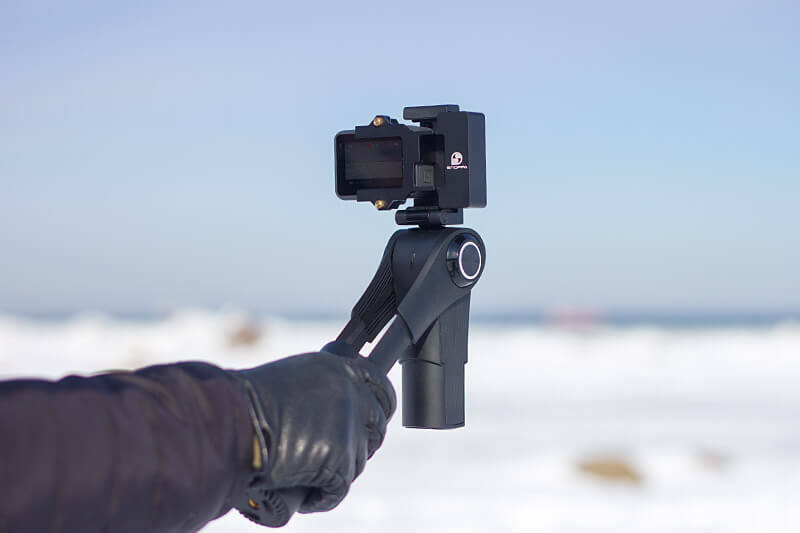 On one hand, I like the concept because it does a few things: Protects the gimbal (it`s protected and has no moving parts except the phone clip), it is a good way to shut down the gimbal without touching any buttons (great for cold weather operation). On the other hand, your hand WILL get caught when you clip it shut. Obviously, this is a concern Snoppa is very aware of and they have a warning sign on the handle so you need to always pay attention on how you hold it in your hand because you need a slight slap to the bottom of the grip. If you hold the top part a bit too low it will “bite” your skin as it happened to me twice before I learned my lesson and adjusted my grip. The other thing that you will notice about the Snoppa M1 is that it only has ONE button. It will switch the gimbal on and off and change between different modes. There is also no joystick on the gimbal. You can switch between the modes with a push of the button and you can adjust the heading of the camera when you are in Omni Track by just pointing the camera to wherever you want and hold it for a second and it will lock to that position. You can use it for selfie mode! Snoppa M1 – Is it smooth? Yes – In terms of how the gimbal performs smoothing out the shake of your hand I think this is a really good gimbal. The movements are smooth and the reaction speed is on point. If you use it as an everyday gimbal it works well and for an everyday user I give it a thumbs up. In terms of the range of motion, it does have drawbacks. The Tilt axis is pretty limited – only around 100° which is not much. No worries if you want to hold the gimbal high above your head but if you want to go low you will need to flip it upside down. The best angle you can hold the gimbals handle is about 90° (flashlight mode) if you want to move any further the handle will start to collide with the phone clip and mess up your shot. Also, if you want to move “under” the gimbal it will freak out when you try to go past the full horizontal position to move the handgrip part to the front of the gimbal. So this puts a pretty heavy restraint to your movements in terms of the tilt angle. The Great thing about the M1 though is that you can use it in portrait mode! You can really see that this gimbal is aimed more at the smartphone user since the portrait mode is the way to go if you are snapchatting or doing an Instagram live feed etc. All you need to do is hold the gimbal in a fairly upright position and just position the camera to portrait mode. When you are in portrait mode you need to keep the grip in a vertical position because if you move it to a horizontal position the gimbal will switch back to landscape mode. So one of the key features of the gimbal is the App, With a lot of the other gimbals the app is more like a nice to have feature but with Snoppa the app is a really powerful tool and has so much more features and options. Object Track is a cool feature that is only available if using the gimbal via the App – Tou can mark a “target” in your frame that the gimbal will stay locked on. 10 points for that feature – it seems to work pretty well and it`s perfect for tracking someone in your shot while you move a lot in relation to the subject. The panorama mode didn`t work for me at all – the photo stitching is awful and if in landscape mode it manages to stitch the images a bit it fails miserably when trying to stitch the panorama in portrait mode. To me it doesn`t make much sense to shoot a panorama in landscape position – the result is a long sausage like this. Turning your phone to portrait position would give you a lot more to capture but unfortunately the Snoppa M1 only handles the panorama in landscape. 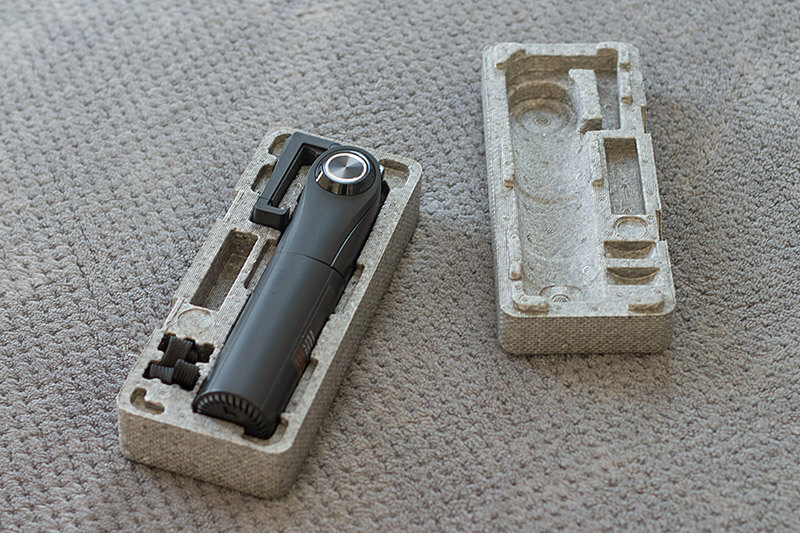 Snoppa M1 – Overall impressions. 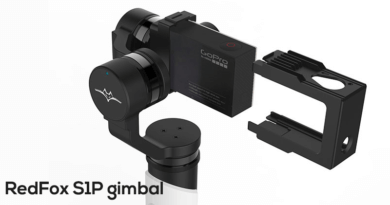 I am really undecided on this one… The gimbal looks great and has a real quality feel to it. It feels sturdy, mostly because of its bulky design and I can`t fault the smoothness of the image at all. There`s no motor noise and the gimbal is easy to use. The Object track feature is amazing and has so much potential but you only have it when using the gimbal with your smartphone. If you want to use it mostly with your phone – it’s a good choice. 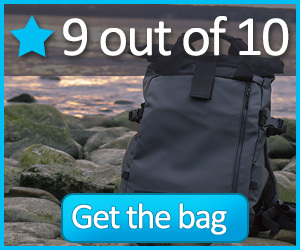 It`s very affordable (around 100 USD) and delivers a very smooth image stabilization. If you are happy with the limited tilt angle it`s a good gimbal. 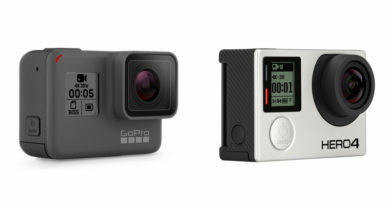 But if you are a GoPro user or need more freedom of movement you might want to look at some of the action camera gimbals out there. They might cost you a bit more but you will save on size/weight and get better range of motion. 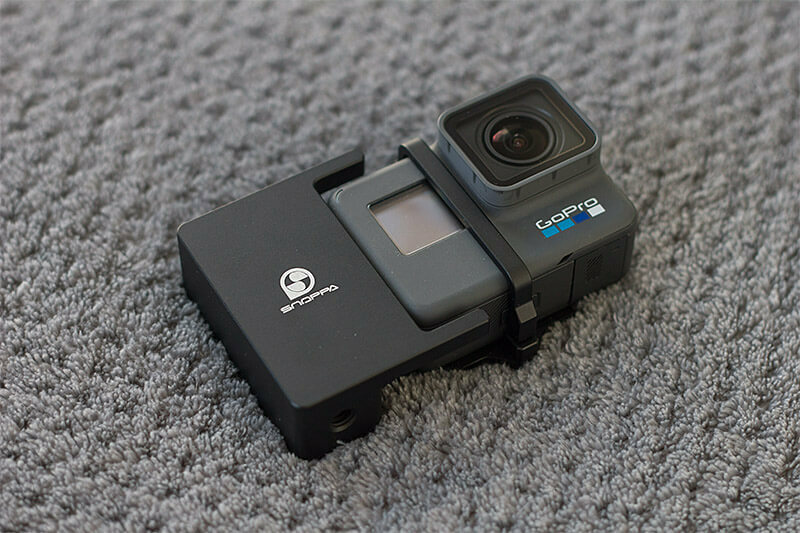 I need the snoppa m1 gopro6 adapter command. Do you want more info?